Tabs are so handy and easy to open that we sometimes end up opening too many of them – so many that we don’t know which one is which. If you’ve had this experience and could use a little help with identifying your open tabs, we have awesome news for you. 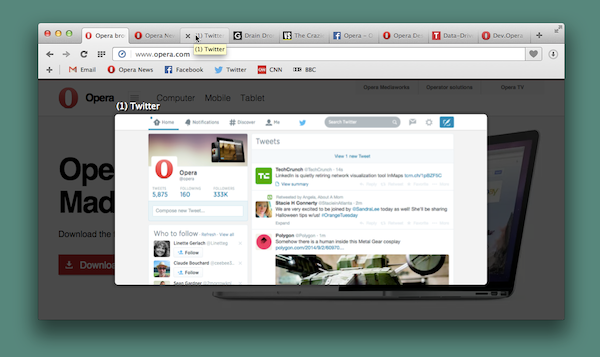 But, even if you are not using many tabs, previews can still come in handy. Do you want to check if something’s new on Facebook quickly, without losing focus on what you are actually doing? The previews are big enough to get a glimpse of your Facebook tab without actually switching over to it. 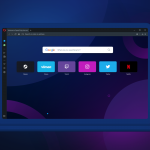 Opera 24 for Windows makes full use of your higher-resolution, or HiDPI, screens. These screens have more pixels packed into the same area as normal screens, which means that rounded corners and text can look much crisper. Now, our user interface looks crystal clear on such displays. And wait until you can experience your favorite websites in HiDPI. We’re sure you will love it! If you are interested in everything we changed, have a look at the Opera 24 Changelog. See also whats new for web developers.